BEFORE extending the application of the Keyline beyond the first simpleKeyline of a valley and its uses as a cultivation guide, a discussion of soil andof cultivation methods is undertaken in this chapter. This forms a basis for thepresentation of the Keyline methods of progressive soil development. Prior to the introduction of the mouldboard plough one of the greatproblems of agriculture arose from farmers' difficulties in controlling the unwantedgrowth on fertile soil. 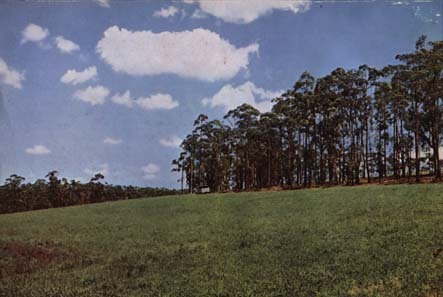 The rich agricultural land obtained by clearing virgin forestareas or breaking up the natural fertile grasslands were hard to hold from the exuberantgrowth of vegetation. The growth made it impossible for the farmer to crop largeareas. The mouldboard plough, by turning over the soil and burying the unwantedgrowth gave the farmer better control. He could then hold and crop larger areas ofland. The advantage of the new power cultivation which was later introduced,lay in the further increased speed to control the unwanted growth. Rubbish was turnedunder to produce a "clean" soil surface. After the earlier slow work to control this growth the new implementinspired a fetish for "cleanness" and "fineness" of cultivation.This fine seed-bed, almost universally acclaimed, produced bumper crops year afteryear and the rich fertile earth showed little evidence of fertility losses over longyears. This type of cultivation and the other farming and grazing methodshowever, were generally destroying natural fertility much faster than the crops whichwere profitably extracting some of it. Eventually, when erosion became a serious menace, some nations undertookan inventory of their soil losses and found that the figures were staggering. Gigantic efforts were needed to arrest these colossal losses by erosion. Fertile soil was not being washed away, but only those soils whichhad already lost or were then rapidly losing their fertility were on the move. Fertile soil was built originally by processes of absorption, growthand decay, and such soil resists erosion. A change of methods from those that extractfertility from the soil to methods that absorb fertility into the soil is the onlyway to overcome the erosion problem. A positive change must be made from ExtractionFertility farming to Absorption Fertility farming. The first requirement, already stated, is the retention of all rainfallin the land for the production of fertility, and not methods to "safely"allow water to leave the property. It is economically unsound merely to prevent erosion losses of poorsoil. Soil fertility can be built back into the soil in a positive mannerso much faster than the natural fertility was lost, that little need be done fromthe negative standpoint of controlling erosion. The best methods of soil developmentare the surest means of erosion control. Continuance of these methods will quicklyproduce as good, if not better, soil than that which originally existed. While these methods are being followed, even from the first year,better farm yields will result. Absorption, growth and decay make fertile soil, andthe factors which produce the maximum growth and decay can be controlled in farmingpractices. The needs of the farmer are satisfied at the same time. There is little evidence anywhere in nature to support the "takeand put" theory of farming where farmers are taught to "put back"into the soil each year what they "take out" in crops. So much of whatis taken out is composed of materials that are available in unlimited supply fromthe sun, air and moisture--moisture alone requiring conservation--that if farmerscease to "mine" the top inches of the soil and farm the land, little ifanything else need be put back. Fertilisers should be used when they are necessary,but they are rarely the "first" need. This is true of most of our farmingand grazing lands. Correct cultivation is a means of progressively improving soil structureand soil fertility, thereby developing a greater depth of fertile soil. Better cropproduction is incidental to the process. The mechanics of the process of soil development whereby Nature builtup the great fertile soil belts of the earth are now reasonably well understood bythe farmers. Good writers have made of the process an absorbing and fascinating story.Some see in it a miraculous efficiency and give estimates of the time required tobuild one inch of fertile soil--varying from a few hundred years to ten thousand. If the natural process is efficient and the time estimates of evena few hundred years are correct, there is little that could be done by us in theproduction of soil. However, nature's methods do not take time into any serious account,whereas to us "time" is all important. The processes which developed natural fertile soil are capable ofcontrol and tremendous acceleration. The dead stalks of plants, slowly laid downby nature loosely on the land surface, decay. This is one fertility process whichis capable of acceleration. Each time decaying vegetable matter dries, decay temporarilyceases and fertility processes are slowed down. Processes of decay are increasedwhen moisture is present. This decay, to all intents and purposes, is fertility. Man and his machines can stimulate decay and growth tremendously. When vegetation is stirred into the aerated part of the soil, decaycontinues for a longer period. Moisture remains longer to supply the needs of decay. Every process and activity in the improvement of soil can be controlledand increased by the farmer, to the continual betterment of his soil. Not all naturalsoils are fertile--far from it. Where suitable moisture, heat conditions and mineralsexist, fertile soil develops in time. There is a certain progression in the developmentof soil in nature. The growth and decay of primary and simple forms of plant life-eventually create conditions suitable for the growth of better crops and grasses. Through the lack of some essential, this process toward the developmentof fertile soil will cease, or slow down. Thus poor natural soils exist in many areas. Vast areas of these poor soils of nature can be made fertile and productive,by supplying the needs to complete their full cycle of development. Natural shortages of vital minerals often can be remedied economically. Keyline road and timber strip with pasture areas above and below. This pasturestrip, which is now nearly two years old, was formerly the poorest land on "Nevallan".Note that the timber strip swings to the right around the hill. The tops of the treescan be seen through the tree line. The trees have grown spectacularly during thelast 18 months from the conserved moisture held by Keyline cultivation above thestrip. Rainfall or other moisture sources can be controlled efficiently,to promote more rapid growth and decay. Great improvement will be made in many ofthese soils in a year or two. New plants and grasses that will continue and completea cycle of high fertility can be introduced. Plants draw their sustenance mostly from the products of decay, fromand with moisture contained as a water film in the "pore" space of thesoil. Generally, maximum pore space promotes maximum growth by the greater availabilityof pore space moisture. The pore space is multiplied by increasing the supply ofvegetation for decay and for the production of humus. These vitally important factors are increased also by the correctmechanical mixing of vegetation into the surface soil. Correct aeration of the deepersoil and subsoil will progressively convert these to deeper fertile soil. Some soil scientists estimate that there are 70 tons of living organismsand other life in an acre of fertile soil. These organism generally work towardsman's health and well-being. The importance of fourteen five-ton truck loads of microbes in anacre is overshadowed completely by a sheep or two to the acre. The sheep or cattleobviously need constant care, but surely this other "livestock" warrantssome conscious thought when it is so vital. All the elements of growth are made availableto us by the various processes of the life cycles of this "life in the soil".Soil management can reduce this dynamic force to a low ebb, or tremendously stimulateits activities. Fertile topsoil and even very poor soil can be treated as a yeast.Fed and cared for, it increases. Starved and asphyxiated, it dies. Processes of decay are the multiplication of soil life. These processesinitiate or commence in the presence of moisture, air and heat. All three are necessary.This suggests that a starting point in soil development should be a critical examinationof farming practices as to their effect on these factors. Past cultivation habits have destroyed soil fertility to the stagewhere vast quantities of once valuable soil have been lost by destructive erosion. Pounding and pulverising, turning and slicing implements have allinterfered with and reduced pore space in fertile soil. Soil suffered too much cultivationeach time it was worked. Extremely fine "seed-beds" are still produced on some farms,almost as if the crop in its growth was expected to devour every fine soil particle. Too fine a cultivation destroys the soil's structure, smothers andreduces soil life, thus degenerating the art of soil management into a bandit-lifeprocess of fertility extraction. Soil fertility need not be "extracted" or destroyed to producegood crops. Crop production is properly a part of an important method in the developmentof better soil. Cultivation can be either the mammoth destroyer of soil fertilityor the greatest single means of improving and even the creating of more fertile soil. An understanding of the structure and condition of naturally fertilesoil and an appreciation of just what is happening, or has already happened, on somemajor soil areas will indicate logical means of improvement. Fertile soil is loose, absorbent and pleasant smelling. It is darkin colour caused by decay in the production of humus. It receives rain quickly andallows it to penetrate deeply. It holds moisture in pore spaces which are found inand around every particle of decaying material and in humus as well as around themineral particles of the soil. Moisture dries out of fertile soil slowly from theeffect of the highly insulating structure of its surface. Deep soil and subsoil moistureis protected from the drying effects of sun and winds. There are no definite horizons to the top soil, deep soil and subsoil;one merges gradually into the other and all are subject to a gentle stirring actionfrom the larger forms of soil life and from the action of deep roots which bringnutrients to the surface. There is no sharply defined plant root zone in naturalfertile soil. Shallow, medium and deep root growths mingle. Root decay acts to aeratethe soil to an appreciable depth via the cavities left by the roots after decay. The fluids, acids and gases of the fertile soil act continuously onthe deeper mineral particles of the subsoil and rock below, converting these to formswhich are later available to plants, and so improve and deepen the soil. Soil life flourishes according to the varying condition of food supply--moisture,air, minerals and decaying. plant life. The whole body of the fertile soil is teemingwith dynamic energy--growth and decay is continuous and simultaneous. Cultivation that is highly successful mechanically in controllingsoil for crops also has had the effect of separating the body of the soil into sectionsand horizons. Only the topsoil has been used to yield crops by these extraction fertilitymethods. Replenishment of the very small amount of minerals required from thesubsoil has been rendered ineffective. Eventually this manifests itself in top soiland crop deficiencies no matter how fertile the soil originally. These soil deficienciesreach man and affect his health through impoverished foods. Plow soles or hard pans have been formed at the cultivation depthby implements that exert a positive pressure on the soil at this depth to enablethem to operate effectively. Plow soles resist the penetration of moisture and air.Surface soil above these plow soles becomes waterlogged in wet seasons. Deeper soiland subsoil dies from asphyxiation. When this happens plant roots have nothing to gain by penetratingthis dead soil. These are all vital factors in maintaining and building soil fertility. Vegetation is controlled by such soil turning implements by simplyburying the vegetation in a sandwich. This layer of turned-under vegetation actsto separate the soil further. It may remain dry, resisting decay and. insulatingthe top soil from the deeper soil moisture, thus making crops more and more dependanton well-distributed rainfall. Partial crop failure becomes more common. Full decayand growth are both interrupted. A too fine surface working of such primary cultivationfurther reduces the effect of rainfall by self-sealing tendencies. This will retardthe infiltration rate of rainfall to such an extent that water will often be erodingsome of this soil before all of it is wet to a depth of three inches. Finely cultivatedheavy clay soil will very quickly form a sealed surface .during heavy rains. If mouldboard plows are used for deeper cultivation total crop failuresoften result. By deeply burying the surface soil, the soil life is destroyed. Soilof poor structure and fertility is turned up to the surface. Considerable time isrequired to make it again productive. Surface chopping and slicing implements, if over-cultivation is avoided,are much less destructive to soil fertility. Good management and such implementscan start a cycle of soil improvement. They do tend, however, to separate the soilinto sections by their even bottom-depth cultivation, and the danger, already mentioned,of destroying the completeness of the soil is ever present. With all the other abundant ingredients of fertile soil, what depthof the land is available to the farmer to supply the very small amount of mineralsnecessary? It is certainly not the alleged six or nine inches of top soil, vast quantitiesof which have been removed by erosion. The depth of soil available to supply thesmall mineral requirements extends to at least the full depth penetrated by the rootsof the large trees. The whole deep root system of trees, occupying as they do usuallya much greater area below the ground than the trunk and branches above, are continuouslybringing in all the necessary minerals to the trunk, branches and leaves. Some of these minerals gathered by the roots and contained in theever-falling leaves, twigs and small branches are available continually to improvethe soil. Trees are a part of the fertility of the soil. Some need to be "left",or grown in a logically planned manner, to serve the soil and protect the land. Originally, large areas of land when only partly cleared, maintainedhealthy stock. Now, some years after complete timber destruction, it is unable tosupport healthy growth without added trace elements such as copper, zinc, cobalt,etc. No doubt these were once supplied to the surface by the growth of timber asdescribed. Deep-rooted plants and grasses will all root deeper if the soil isdeveloped fully, and will bring minerals toward the surface. The importance of preserving this complete process to the full depthof the soil--which includes top, deep and subsoil--has generally been entirely overlooked.Implements that tend to separate the whole body of the soil into defined sectionsare destructive to soil fertility. The all-over, even-bottom depth cultivation, whethershallow or deeper, destroys this soil completeness. However, it takes an appreciable time to destroy fertile soil. Bywrong cultivation methods, farmers have been able to produce vast quantities of grainfor generations during the process of fertility extraction. Now this soil has lost its former structure and its capacity to absorbfertility. Its destruction is much more rapid. Usually only three inches or a littlemore of the earth was used, while the basic materials for the improvement of fertilityexisted both above and below in limitless quantities. There is a general belief that the supply of food will be--almostis--the limiting factor in the ultimate population of the earth. It is likely--becauseof the tremendous supply of food potential in and above the earth and oceans--thatsome factor, other than food supply will first impose the limit. There has been available sufficient knowledge of soil to produce smallareas and amounts of highly fertile soil for a long time. What is of particular importancenow, in the further development of agricultural Australia, is a means of inducingor producing fertile soil over large areas of land quickly and profitably. It isonly necessary to maintain the soil in a condition to absorb all the vast fertilitypotential of the sun, air and rainfall. If the rainfall is absorbed into the earth,the store of minerals, chemicals and gases it carries always is filtered out of itand retained in the soil. While oxygen--and rainfall is practically a saturated solutionof oxygen--is probably needed by our soils more than any fertiliser the farmer usesat present, there is a considerable variety of other fertility factors taken outof the air by rainfall. Some plants that actually grow without contact with the earthhave been found to contain a comparatively large amount of element in their ash-elementof the "trace" variety--which they must, somehow, extract from air andrainfall.